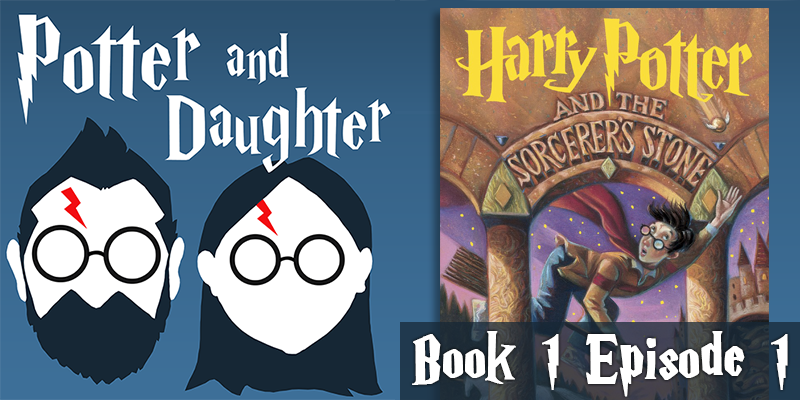 In this first episode of Potter And Daughter, cartoonist Joel Watson talks to his seven year old daughter, Lily, about the first six chapters in Harry Potter And The Sorcerer’s Stone. They spend some time on the current state of Harry’s life and how it rapidly begins to change with his introduction to the Wizarding World and his journey from Privett Drive to Hogwarts School of Witchcraft And Wizardry. Our Patreon Patrons get new episodes one week early! Wow this show is awesome! My daughter is 10 and just started the series. Thanks! I’m really glad you like it. Maybe your daughter can use it to remember what happened between reading books. She and I actually collaborated for someone during the last Fancy Sketch Drive with a “Harry Vs. Voldemort” piece. I think I posted it on Tumblr. harry’s not a pureblood, his mom was muggle born, therefore he’s half-blood, like voldemort. So then, Harry’s and Genny’s kids start a new pureblood line? Or are they always halfblood since they have a Muggleborn Grandmother? I think it depends on who you’re talking to within the Wizarding World. Harry or the Weasleys (except MAYBE Percy), would probably agree with you, but the Malfoys would probably say that as long as there’s any muggle or muggle-born blood in a Wizard’s heritage (at least as far back as can be traced) they would be Half-Blood. But Lily is a witch and therefore, even though she was born Muggle, Harry is pureblood. Voldemort was half-blood because his father was pure Muggle, completely unmagical. Ron and Hermione’s kids will be pureblood. Also: It took me way too long to realize that the song at the top is about Harry’s copy of Advanced Potion-Making. Yeah, this lines up with my understanding of blood status as well. I can see how dark wizard family’s might think a muggle or a muggle born a few generations back would “spoil the lot,” but the facts are simple math. Oh and yes, the song is in regards to HBP, but I figured it didn’t really give away any spoilers and it had a sort of double meaning for me regarding the actual HP book series as a whole. Lily was right about Vernon and the Owls in the first chapter. The owls plus “Weirdly Dressed” people kept coming up to him on his way to work.